calibre has been an excellent ebook managing and viewing software for sometime now. But we intend to live up to our slogan, making calibre the "one stop solution to all your ebook needs". 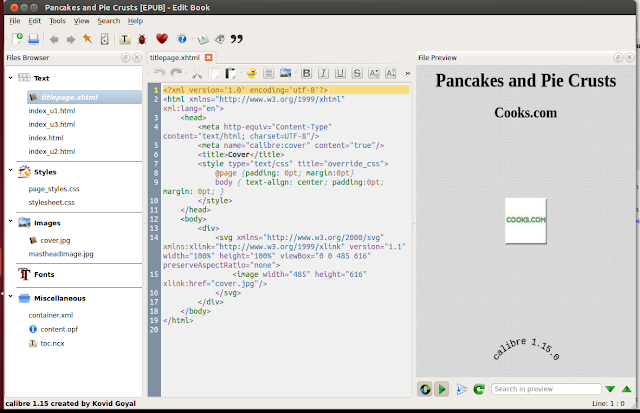 To this end we have recently (since calibre 1.15) added ebook editing capabilities for ebooks in EPUB and AZW3 formats. The editor interface was made more user friendly in calibre 1.16. To avail of the features described below you will need calibre 1.16 or a newer version. To make a few small changes like highlighting, changing font colors, using bold or italics fonts, inserting images and underlining requires almost no knowledge of HTML coding. There are GUI buttons that insert the code for you when you click on them. calibre makes these things as simple as button pushing. 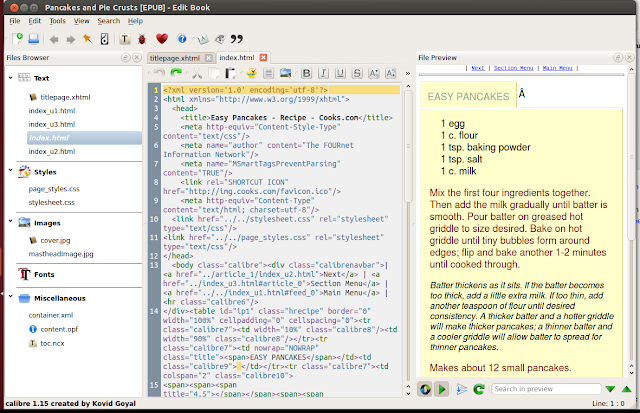 In spite of the top layer of simplicity, the editor is very powerful. Those of you who know HTML coding can do a lot more. This blog post is directed towards rather lay users and will explain how to do a few simple but very useful things in detail. As it says on the center of the window "Double click on a file on the left to start editing it". The ebook I am going to use as an example is a recipe book made using the "Recipe Reader" plugin in calibre. 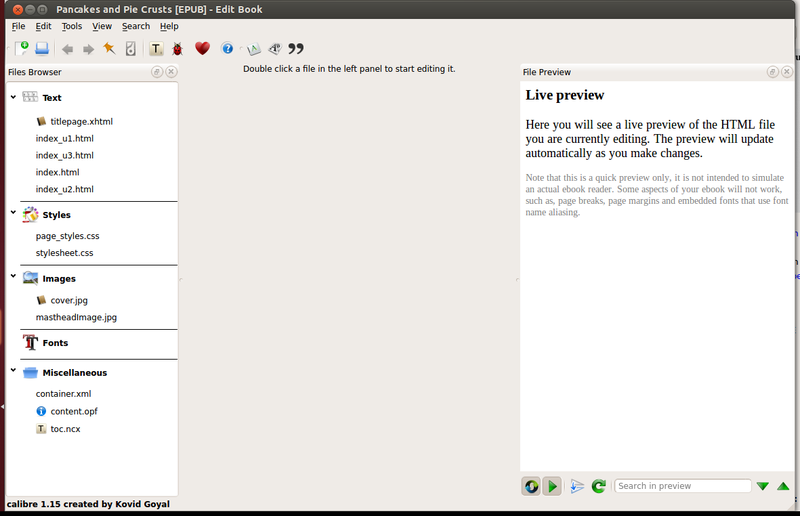 For more details about the plugin you can also check out the plugin's mobileread page. With the holidays coming up you may find this category of plugins useful. 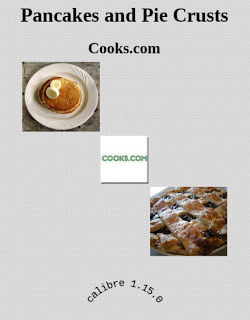 I like to make notes on recipes I have used for future reference and calibre's ebook editing feature allows me to do just that as I will demonstrate. in the top toolbar. 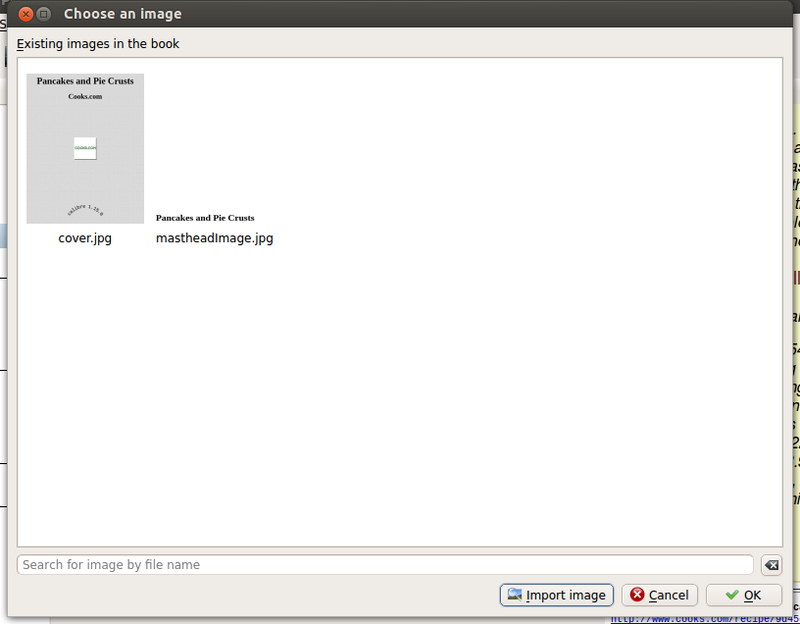 Still feeling nervous, the first time you use this editor make a copy of the book in calibre and work on the copy. Now getting down to the action. Let us start with editing some simple text. 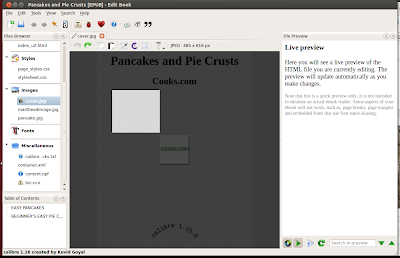 The following is a picture of the toolbar in the center column. 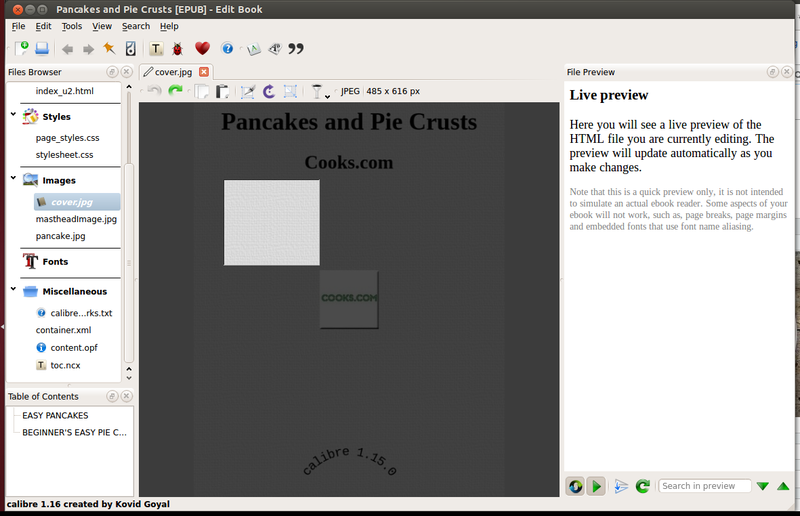 From left to right the buttons are "Insert image", "Bold", "Italics", "Strike through", "Subscript", "Superscript", "Font color" and "Background color". 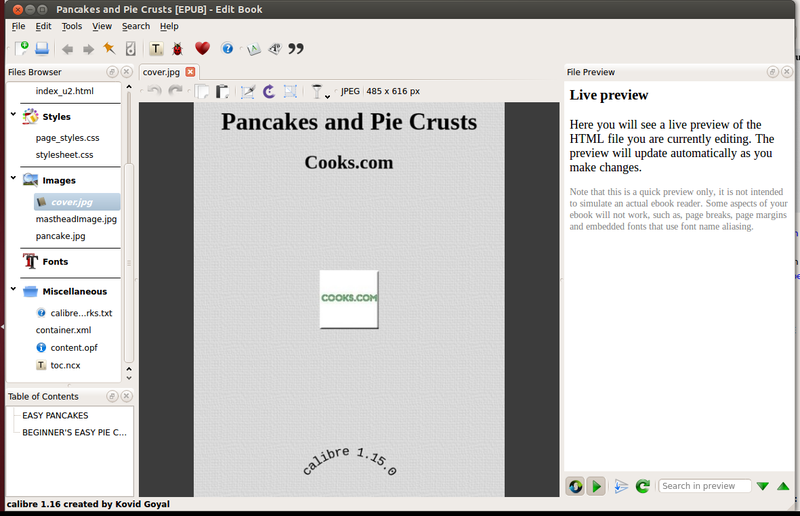 The live preview on the right shows what the changes you made will look like in the ebook. To change the color of already existing text just select the text in the HTML code and click the font color button and choose the color. Similarly to make some text into bold just select it and click the bold button. On doing so, as you can see from the picture above, the text in the HTML code as well as in the ebook are converted in to bold format. Same for italics. To highlight a bit of text select the text in the HTML code and click on the background color button and choose the highlight color. 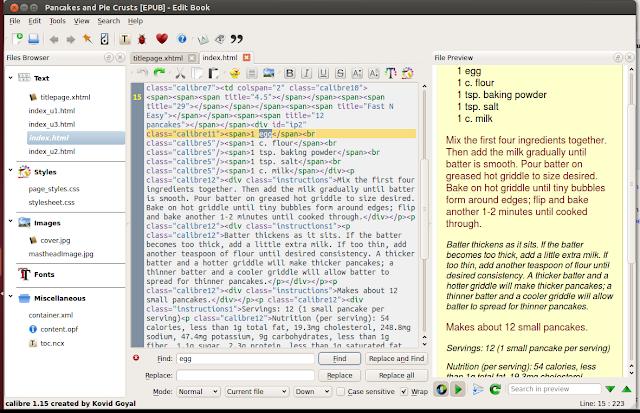 The following picture shows a bit of text highlighted purple. The code as in all previous cases is automatically inserted on clicking the appropriate button. before the word "Batter" in the HTML code as shown in the picture below. The calibre ebook editor also allows you do some simple image editing. Double click on an image you want to edit from the list of images in the left column and it will open in the middle column as shown below. 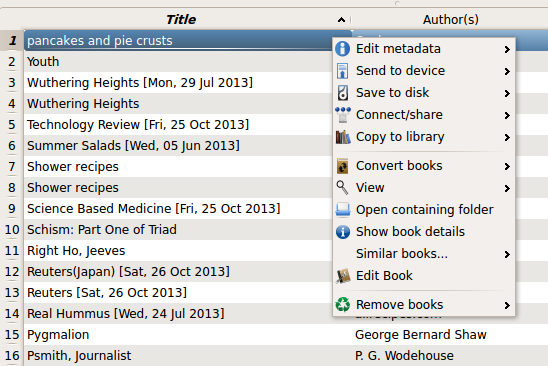 These are some of the simple and most useful things the new ebook editor feature can do. 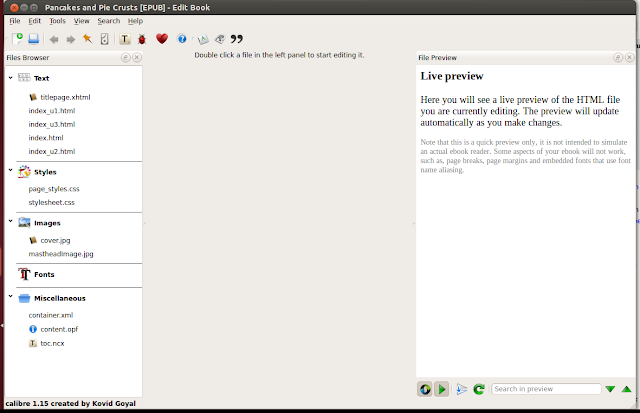 We will be adding more features but if you want to edit ebooks this should help you get started. Dive in and enjoy yourself.